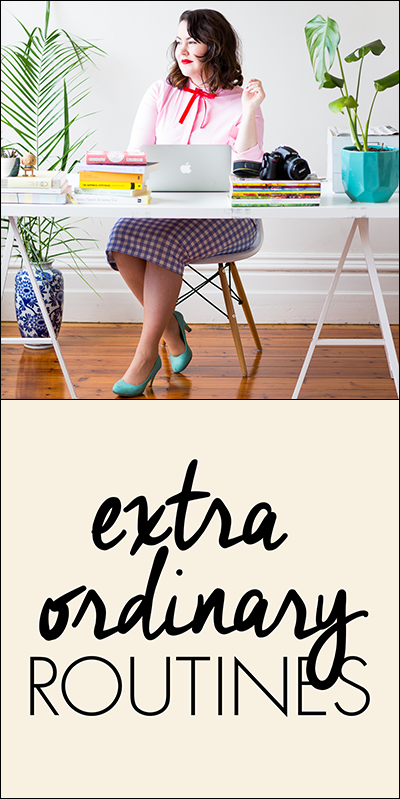 In 2014, I started my online interview project Extraordinary Routines as a way to uncover how creative people go about their days. The aim of the project is to hone in on this idea of coping and illuminate the challenges experienced by creatives through exploring their daily life. The interviews are mostly long-form, and diving into a subject’s day has helped me to uncover pragmatic tips on the creative process as well as advice on how to live life a little better. The project has since grown into live interviews, articles, art projects, and I regularly experiment with my own habits and routines—from a blind dating experiment, to a 30-day habit challenge. I’ve also spoken at writers festivals, delivered talks, hosted panels, written a monthly column for The Design Files on the topics of routine, creativity and more. 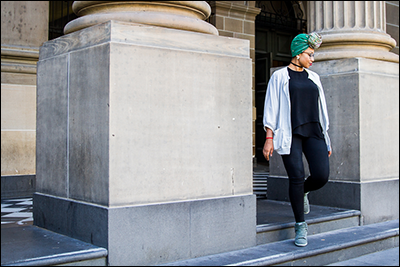 What started as a way to build my own interviewing and writing portfolio funnily enough led to a great job as the Deputy Editor at ArtsHub in Melbourne. I spent two years balancing the project with full-time work. This meant conducting interviews after work and transcribing, editing and uploading interviews on weekends. I’d often fall into the trap of beating myself up for not having a set routine with my blog about routines—say releasing a new interview every Monday—but I found that there was still a community of readers who looked forward to each new interview, even if it was ad-hoc. It taught me a lot about not getting caught up in our own rules, expectations or perfection—with a side project, do what you can and put it out there. After a few years of juggling both a full-time job and my side project, I found that I was getting enough freelance work, as well as corporate commissions, to be able to quit my job and sustain a freelance career. It’s been an interesting adjustment learning how to find balance as a freelance writer and expand a side project: Do I monetize Extraordinary Routines or keep it purely as a portfolio? Do I focus on finding corporate work, or spend more time pitching to dream publications? How long do I work each day? I decided to turn to other freelancers for advice and put together the lessons learned in an article earlier this year: “Lessons on being the worst freelancer”! Now I try to view all the work I do as interconnected, and instead of aiming for a perfect balance, seize the biggest opportunity on offer. This has meant traveling to NYC for three months, interviewing incredible creatives in Australia and abroad, working with new clients, and more. I’ve long believed that if you can’t find the job you want, create it. Extraordinary Routines initially came about when I returned to Australia after a stint overseas in Denmark. I was unemployed, directionless and missing the life I had overseas interning and working for a local English newspaper, creative agency and magazine. I missed interviewing and meeting interesting people, and needed to find a way to bring that experience into my current life. It was competitive to find paid or established roles in this specific niche, so I decided a side project was the way to go—to both build my portfolio but also explore a curiosity. I’d long be fascinated by how other people spend their days and often found myself skipping to the question about daily routines in magazine features, and thought it had enough scope to form a project of its own. For anyone who is feeling frustrated by the lack of opportunities after graduating, or stuck in their current job or career, I highly recommend tinkering with a side project. It can be as big or as small as you wish—a daily commitment to draw something or write a line of poetry—or a fully-fledged blog. I’d also emphasise the accessibility of side projects—unlike unpaid internships, we have complete creative control over our own projects and they often propel us further than working for somebody else would. We can dial up or dial down how much time and energy we put into our own side projects, too. Whatever it is, having something of your own can create freedom in an opportunity that you can’t even imagine—most of the work opportunities, friends I’ve made, and experiences I’ve had in the last two years all stem back to Extraordinary Routines. In a recent interview, cartoonist Chaz Hutton puts it perfectly: “For me, it was never a strategic move to make this my job. It was a side project that was almost like a raft—I had my career as an architect that was the stable boat, but someone else was always driving. So I made my own little raft to kick off the side, and even if it was never sea-worthy, it was my thing, my little beacon of hope. Without your own little raft, it can be so easy to become disenchanted.” Build a little raft of you own and see where it takes you. Diptych courtesy of Madeleine Dore.